Now that I work out of the house again, days when I am home have been spent frantically cleaning, purging (seriously, does stuff just breed overnight or something?) and organizing. But, this last Monday was a different story. The hubs had to work. The child was at school. It was about 11 o'clock and laundry was in full swing. The floors had all been steam mopped. The DVR was all caught up. My binge-watching on Netflix (Gilmore Girls) is complete. You get the picture, though. Right? Well since I was in between loads of laundry, I decided I had time to whip up something casually in the kitchen like the good ol' days of daycare nap time. However, I was craving cookies. That's my Grandma's beautiful handwriting. I miss her dearly. She's the one who taught me that love comes from the kitchen. It wasn't labeled with a title, but I knew it had to be a sugar cookie from the ingredient list. I figured I had nothing to lose but time, so I gave it a whirl. I did make a few modifications (the rest of the directions/frosting recipe is on the back, which I didn't think to take a picture of). And I came out with a cookie that isn't too sweet. A bit harder or firmer than the cut-out cookies I typically make. It's a thick cookie and kind of reminds me of a shortbread. 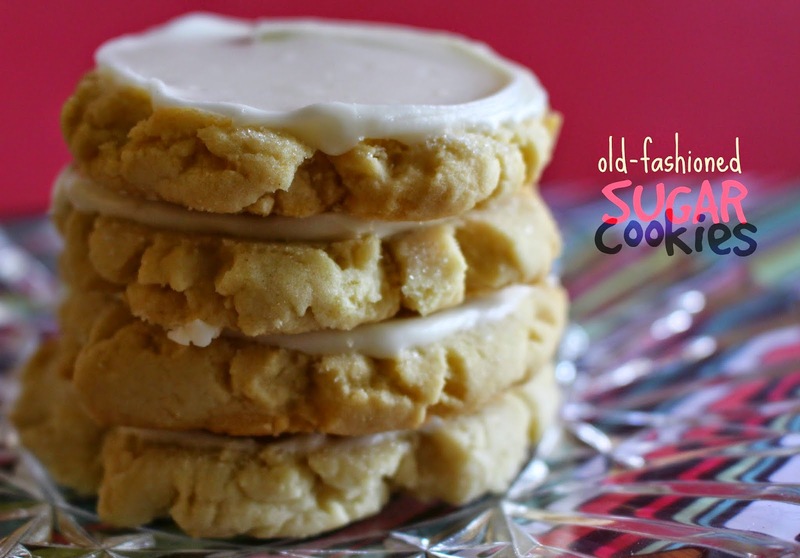 If really sweet isn't your thing, this is definitely a great cookie for you! You can chill the dough, which is what the recipe says to do, but I just went for it and made balls with the dough. It is firm and really easy to work with, so I didn't have any problems. They also didn't spread hardly any at all. So how you put them on your cookie sheet will be how they look when they come out. The recipe is a sour cream frosting and is really, very good! You can color it easily, of course. I didn't, as you can see. Or put on any sprinkles which my daughter looked at me like I was alien for not adding. If you want it a bit sweeter, a typical buttercream frosting recipe I think would be wonderful on these! I ended up with 4 dozen (48) cookies from this recipe. I boxed them up and told the hubs to take them to work the next day. Then I realized...duh! I work with people again!! (Well, grown-up people who don't just want hot dogs, mac-n-cheese and Popsicles). So my work got to be my guinea pigs and eat them. They were all gone before the end of the school day. In a mixing bowl, with the paddle attachment (or by hand) cream the butter and sugars together. Slowly add the oil, then the eggs - one at a time until incorporated. Slowly add the flour mixture, cream of tartar and baking soda. Mix until the dough holds together. Using a 1/4 C measuring cup, scoop out the dough, tear it in half, placing the torn side down on an ungreased baking sheet. Dip the bottom of a glass into a small bowl of sugar then press onto the top of each ball of cookie dough, repeating the sugar dip for each one. Bake for 10-12 minutes, or just until the bottom edge is turning slightly brown. Let cool on the baking sheet for 5 minutes before removing to a wire rack to cool completely. *If wanting to make cut-outs, chill the dough for at least 2 hours, then roll out to desired thickness and cut using desired shapes. In a mixing bowl, with the paddle attachment (or by hand mixer) cream together the butter and sour cream. Add the powdered sugar 1 cup at a time, mixing after each addition. Slowly pour in the milk and continue mixing until it reaches the desired consistency you would like for frosting the cookies. Stir in the almond or vanilla extract. Using an offset spatula, frost the tops of the cookies. Let the frosting "set" or harden a bit before packaging or storing, or the cookies will stick together.